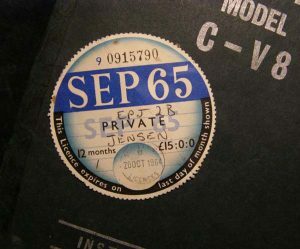 The so-called ‘Cooper’ Jensen CV8 was acquired for the Museum in 2003. The acquisition taking place through curator, Ulric Woodhams’ association with former Jensen photographer, Michael Cooper. The Museum looks at the life of Michael Cooper’s father, George, and his ownership of two iconic Jensens. The first tax disc for CV8 104/2200. Jensen CV8 104/2200 was ordered with a specification of regal red and beige leather trim. The car was completed at the beginning of June 1964, and underwent its initial roadtest on 4th June, with final inspection taking place on the 8th June. 104/2200 was sold in October 1964, being purchased by Mr.John Bellord, the joint owner of Honeywood Convalescent Nursing Home, situated in Rowhook, Horsham, Sussex. The car was assigned the registration number ‘EPJ 2B’, and was delivered to its new owner on the 22nd October 1964. 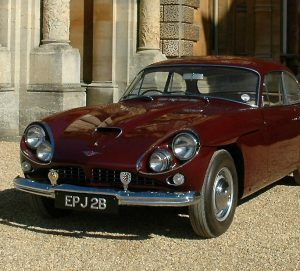 Bellord wished for the car to be delivered to his chosen car dealership, Chichester Automobiles Ltd, however, since they were not official Jensen distributors, the sale was undertaken via the London-based Jensen distributors, Charles Follett Ltd, to Chichester Automobiles Ltd. In just over a month of ownership, Bellord had notched up his first 1000 miles, and the car required its first service. Bellord decided to drive the car up from Sussex to the Midlands, so that this initial service could be dealt with at Jensen Motors themselves, even although he was rather put out that he was expected to pay for the first service, when many manufacturers offered the initial service for free (mileage 888 miles on 30.11.1964). 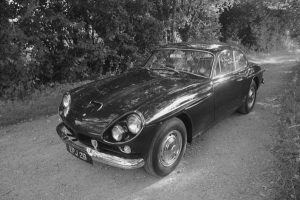 Jensen Motors received the car back again on the 26th April 1965, for servicing and some rectification work under guarantee. The car had covered 4822 miles. This would be the last service carried out at Jensen Motors, subsequent servicing took place at Bellord’s local garage, Coombs of Guildford. The owner, John Coombs, had been a well known racing driver, and set up a Jaguar dealership. In 1967, typically after three years of ownership, the CV8 was disposed of by Bellord, to Coombs of Guildford, who took the car into stock. Bellord possibly part-exchanging the car against a Jaguar (records show the CV8 as a stock car with Coombs by August 1967). The second owner of 104/2200 was Mr.George Stephen Cooper, from Shere, near Guildford, in Surrey. He had previously owned a white Jensen 541, and a set of unfortunate circumstances created the possibility of a change. Having seen the low mileage regal red Jensen CV8 at his ‘old friend’, John Coombs’ garage, a deal was done, and Cooper was behind the wheel of this mammoth V8. Cooper was born in Scotland, but later moved to southern England, settling down near Guildford in Surrey with his wife Alice. The couple had a son, Michael. It wasn’t until the 1950’s, that George Cooper passed his driving test, and this was mostly down to the constant nagging from his son Michael. After successfully passing his driving test, George Cooper purchased a Hillman Minx. Meanwhile, his son, Michael, had just completed National Service, where he had luckily been given a place in the photographic unit of the Ministry of Defence. Now, armed with a Hillman Minx, the ‘Cooper Duo’ would take themselves off to Goodwood for the BARC member’s meetings. Both the Coopers had quickly become obsessed with the mystique and glamour of motor racing, and Cooper junior took particular enjoyment photographing the racing events. It was at one of the Goodwood events that the Coopers had the chance to view a Jensen 541 close-up. The car, which was parked up in the members car park had caught the eye of the ‘Cooper Duo’. Both were taken with the car, particularly by its distinctive sporty design. For now, the ‘Cooper Duo’ had to make do with the Hillman Minx. George Cooper in his Jensen 541. Some many months later, Michael was meeting his father for lunch at a restaurant. George Cooper had (deliberately) arrived early, and sat himself at one of the window tables awaiting his son. When Michael arrived, his first topic of conversation was the gleaming white Jensen 541, which was parked directly outside the restaurant. It was a complete shock, when, with great pride, his father stated he had just purchased the Jensen. Generously Cooper senior allowed his son fairly free use of the Jensen, and once Michael was behind the wheel, itwas a case of ‘hard & fast’ driving, with speeds frequently in excess of 100 miles per hour. 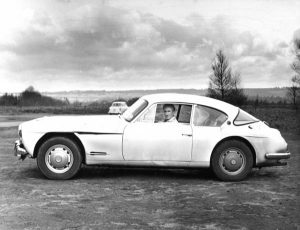 Having by now, carved himself a foothold in the world of commercial photography, the Jensen 541 was copiously photographed by Michael Cooper, however, the ‘hard & fast’ driving inevitably led to an accident. Michael Cooper photographed by his dad’s 541. 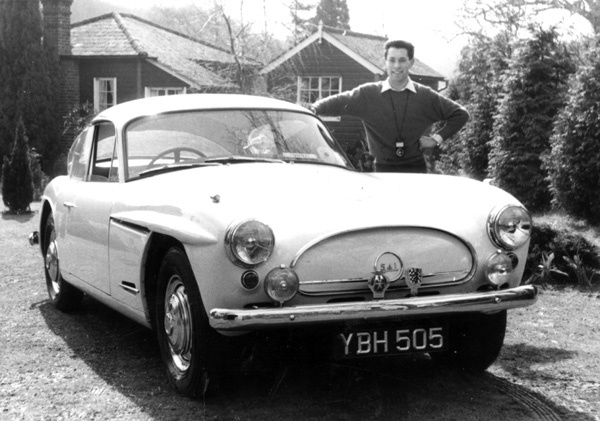 On one occasion Michael Cooper was driving the Jensen 541, with his father and sister as passengers. Michael wound the Jensen up past the 100 mark, when the car in front indicated to turn right. Michael misjudged the closing speed and tardiness of the other driver, and having braked excessively hard, lost control, spinning down the road and hitting the kerb. One of the rear wheels was literally torn from the car by the sheer speed of hitting the kerb, before assaulting a telegraph pole, and coming to an ungainly stop. Fortunately only pride and the Jensen was hurt. The dazed occupants struggled out of the car, and a telephone call made from a nearby house, ensured that the car would be picked up and taken away for repairs. The 541 being taken to Coombs for repair. 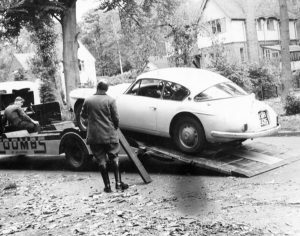 The Jensen 541 was deposited at the nearby garage, Coombs of Guildford. Both George and Michael Cooper knew the owner, former racing driver, John Coombs. When George Cooper arrived at Coombs’ garage to discuss the repair of the Jensen 541, he noticed a regal red Jensen CV8. Immediately take by this large-engined Jensen, Cooper agreed a deal against the 541. George Cooper was the founder of a company called ‘Artworks Ltd’, based in London. As such the CV8 wouldn’t see too much use. The CV8 would be fired up most mornings and driven down to his local railway station, Clandon, where he would catch the train into London, at the end of the working day, the CV8 would be driven the short drive home on his return. Cooper’s son Michael, now found himself away from home with work, and was also with wife and child, so the mileage and hard driving that the 541 had suffered at his hands was not administered to the CV8. At weekends, the CV8 would be fired up, driven down to the shops in Guildford, or the local shop to pick up a paper. This was the routine for the CV8 for nearly 20 years. No doubt the general condition of the CV8 worsened, as it carried on throughout the 1970s and into the 1980s, even although it was generally garaged. Possibly an issue that took place in the 1980s, led to the CV8 remaining garaged. The brakes failed whilst George and his wife, Alice, were returning home after a hospital appointment. Still some few miles from home, George Cooper managed to somehow coast the car back home along twisting narrow lanes, finally grinding to a halt, after swerving through the gates of their property. George Cooper died in 1986, and the CV8 remained exactly as he left it, locked away in the garage. The doors to the garage would not open again until 2003, when Michael Cooper and Ulric Woodhams opened the doors, but that’s another story. ACKNOWLEDGEMENTS: Elizabeth Cooper with assistance in preparing this article. REQUEST: The Museum would like to contact John Bellord, or anyone who knows John Bellord.